What do you get when you combine a popular fish cake manufacturer Odawara Kanko, and a big Japanese toy maker Takara Tomy team up? A very cool fishcake that celebrates both companies. 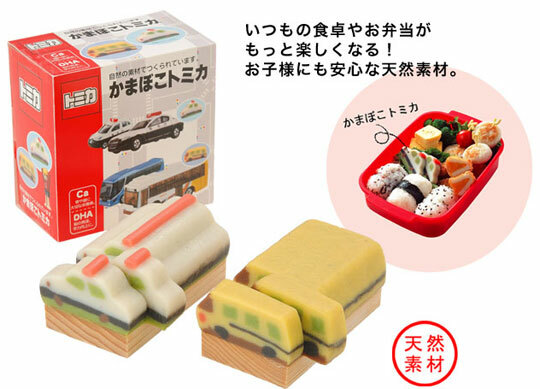 The two companies have created the Tomy Car Kamaboko which just so happens to be shaped in Tomy’s classic toy cars. It’s not often where you see cool things made for fishcakes. They usually are the pink and white forgotten piece thrown on your ramen. If the Takara in Tomy’s official name doesn’t sound familiar, that’s because they merged with Tomy back in 2006. Internationally they are still called Tomy, however Takara is best known for creating the precursor to the hugely popular Transformers.